A recent McKinsey Global Survey (Note 1) has interesting, if predictable, findings as to the capabilities that organisations views as the most important for managing companies through the crisis. Leadership and Direction. Of the 763 companies surveyed, 49% believe that Leadership is the most important capability that organisations require, with 42% believing it necessary after the current crisis. The corresponding figures for Direction are 46% and 39%. The most important capability required by organisations after the current crisis is Innovation (46%). Interestingly only 33%of respondents believe that innovation is important during the crisis. Of the most important leadership behaviors for managing corporate performance, Inspiring Others is rated as most important (46% of respondents) followed closely by Defining Expectations and Offering Rewards (47% of respondents). 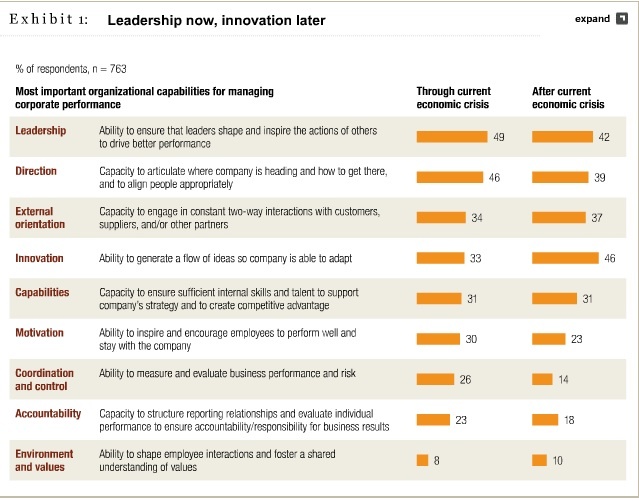 Note 1: Leadership through the crisis and after, McKinsey Global Survey Results, September 2009. You are currently browsing the archives for the Reward category.